How's come my photo in the upper top region of SM - where it says " Welcome Deenie" is my older AVI. It is my American Flag Monkey ( the last avi that you made for me) yet I am seeing the 4th of July Me at the bottom of my posts?? ( the smaller version you made yesterday did work) ..... Yay. Am I doing something wrong? that the American Flag Monkey of Me is showing in the header of Welcome ?? Your the Boss Lady .. I hope you can advise me Thank You Ms. Brandi. It is because that is what you have set to be your avatar in your profile. You uploaded it to SM to be used as your avatar. The one you are using in your sig image is what you have set to use as your sig image in your profile. They are two different pictures and two different options. Upload the BIG avatar image you want to use from my thread to your photobucket account, and then add the URL to that image in your photobucket account to your Avatar image section in your profile. 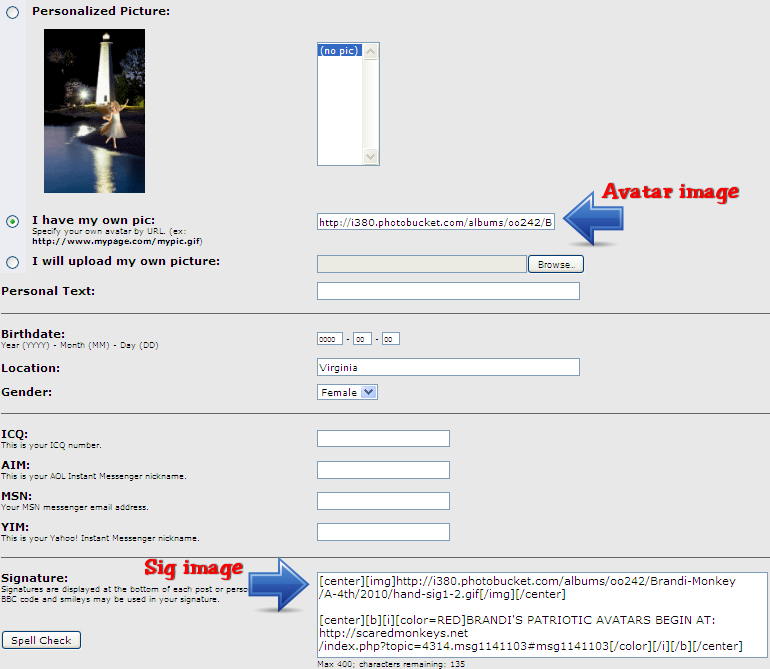 Good work on getting your sig image into your photobucket account and linking it as your sig image, btw! Hi Brandi! Hope your week is starting off well. If you have time, would you mind making a 4th of July avi for me? Maybe with a bow in my hair? I love my spring avi so much, I almost don't want to change it out. This design is what came to mind first, cece. (No bow though.) But you are blinking! Thank you so much Brandi! It is great & I really appreciate it. Thank-you again the pretty frilly dress. Were dressed up for the July 4th, but I have a problem. WHAT is that Seahorse? I will happy to wait until next year if you are backed up with requests. Seahorse, your lil guy has ears! Ears are not very prominent on a seahorse, but they do have them. It's more difficult to see details in objects moving under water! Thank-you for your response. I am looking in the mirror and I see my pointy ears. Brandi, I am sending you a link (just for the fun of it) Kyron's Artwork, what do you think of his Work, please? He looks like a Impressionist, IMO. I know all children are little impressionists, Kyron has a freedom and balance in his work. What do you think? Thank-you. THANK YOU BRANDI YOU ROCK!!!! Hope you are doing well, sparky! I am so glad you like it, cece! Kind of left with not much fresh inspiration. Also, the hiatus our avatars took recently left me not making new stuff, since I didn't know if/when the avatars would return. Anyway, very glad I could offer you something you like. I have admired your work since I came to SM. Your talent blows me away. I need some advice for something that I need for my personal website. I need my logo in script and would like to add a butterfly to the end of it. What kind of program would I need for that? I have GIMP, but that is about it. Hi flutter1, and thank you! Any basic graphics program would be able to accomplish that. Gimp is supposed to be quite good, although I don't use it. I'd be happy to create a few logos for you if you let me know exactly what you are looking for, if you want. You can email me with your specifics or post them here. Or if you have specific questions about how to do it, let me know. Hope you and your family have a great 4th. Thank you for all you for sharing your wonderful talent with everyone...your the best!!! I will be ready for a summer look when you have time...my grands anxiously wait for the change, they always get a kick out of the way you dress the guy. Yikes I should proof read,before I post!! I'll work on your summer look tonight or sometime tomorrow. I'll also give you a normal sized one and a mini to use in your sig line if you like, until we get avatars back! Say hi to the grands for me! It's been a hectic day here today, but I got these two designs made for you. I'll make some more when I get a chance and get inspired. Brandi,here is crank ycrankerson's photobucket on Kyron. I have not looked through all of it,but thought there might be some photos of Kyron you could use. Brandi,here is cranky crankerson's photobucket on Kyron. Note to self....do not answer phone while posting. Thanks, Trimm. She and I have known each other for a while now She's a really nice gal who loves to share her resources. Appreciate your link though.